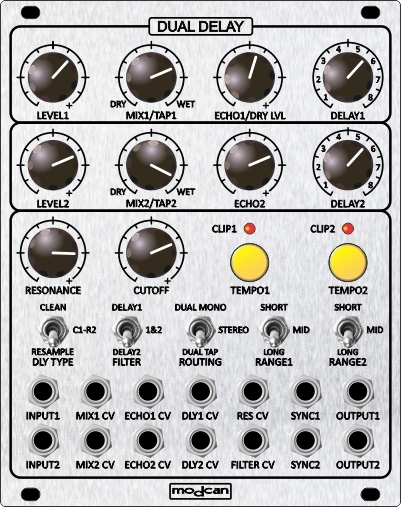 The Dual Delay represents the next step in delay based effects from Modcan. We took the existing Digital Delay 59 from the A/B series and dramatically reworked both the hardware and firmware model to add significant features and enhancements in the conversion to Euro format. The most obviously apparent change was to make it a Dual with independent controls for each channel. We also added selectable modes for delay type. Choices are Re-sampling (pitch shifting effect when altering delay time) and a "Clean" mode for standard Digital Delay effects without pitch shifting. Low noise design using 48kHz sample rate, 32bit DSP processing and 16bit I/O. Other features include 0Hz-21K continuously variable 4 Pole Lowpass filter in the delay feedback path for "Analog BBD/Tape Delay" emulation. The filter has full range self oscillating resonance with voltage control of resonance amount and filter cutoff. Input signals can be routed as two mono delays or stereo or as a dual Tap delay with delays in series internally. Each channel can be either in clean or resample modes and can also be patched in series and parallel for external feedback path. All the functions (except input level) that are controlled by panel knobs have matching CV inputs allowing for a wide range of flexible control modulation. The module uses very low current requiring only 40mA for operation and will work with any power supply between 8 and 15V. Less current than many simple analogue modules.